Holy!! I think what stopped me was the $700 in product!!! I cant wait to see what you come up with, I love stalking your site, and CASEing your work. As a new Demo, your ideas and helpful hints go a long way in making my life easier. I am a firm believer in not reinventing the wheel. I have learned so much from everybody’s experiences. Yaaaaay!! I say go for it! Your work is absolutley amazing and you deserve the Artisan Award for sure!! Best of luck to you!!! LOVE this. 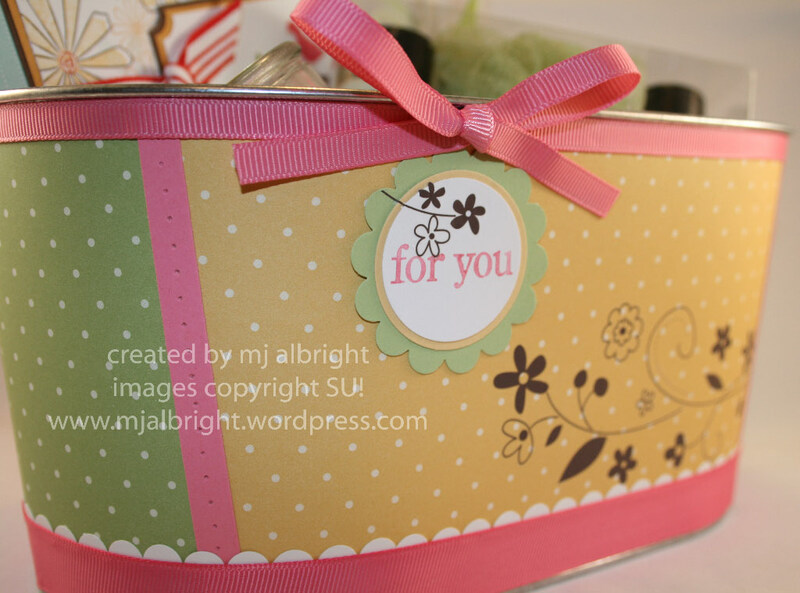 I am inspired- I am going to make a similar tin and a card. Thanks you for all your inspirations and I am looking forward to drooling over your creations in Salt lake City this year. I hope you win! As a friend, I know personally the hurt you felt by some of the negative comments you received. Don’t let them get you down — you have an absolute heart of gold and are so willing to share your talents with others. We are all better stampers and artists in our own right because of you. These projects are amazing — as always. I love the simplicity of the cards and the WOW your hostess must have said when you gave her your gift. Well done! Well done! All the best! You (and your submissions!) are in my prayers! Your creations are always amazing. I love your blog and love that your passion reflects in your creations. Those that have negative comments regarding your submissions are just childish, selfish, and possibly jealous. I believe that those who are gifted with stamping should share with all of us and inspire those of us who love it but may need a little extra push. 🙂 I’m not an SU demo, but I look forward to seeing more of your fabulous creations on your blog and being inspired by them. I just joined SU so I don’t really know what you are talking about with the Artisan Award – but I’ll find out. I hope you keep sharing b/c I love visiting and seeing what you are up to. Just recently, our computer was out of commission and hubby and I were talking about how much we missed being able to get on. I realized that I don’t *need* to blog hop and look at cards — but it makes me happy and brings some beauty to my life. Good luck with winning – I can’t imagine how many projects you created with a bill like that. Do you or have you shared those on your blog? I don’t know if that a no-no or not! Wow, congratulations on finishing your projects and feeling so proud of them! You should enter as many years as you want, your work is inspiring! It should be seen as many places as possible! I’m in a bit of shock over the $700 though, I wish I could see what you made now! Good for you! At first, I, too, asked myself “why is she entering again?”. But, you are a fabulous artist with the freedom to enter again and even win! If SU has issues, they can make a rule about not being allowed to enter again for a certain amount of time if you are chosen as a winner. I can’t wait to see what you’ve made (seeing the $$ spent, I’m extremely curious!)! Good luck and thanks for showing these fabulous projects!! more power to you, girl! We all have reasons we do what we do…and what motivates one may or may not be what motivates another. You have to truly believe in your heart it’s worth it (and you do) so I wish you the best! I’m truly inspired by ALL your creations and I realized a long time ago sleep is more valuable to me than winning an award – you can never get that back hard as you try (see now you know what I am motivated by) HA! MJ, I’m reaching out and sending you some big hugs! I’m stunned and speechless that you would receive negative comments about entering again. Besides the fact that you are seriously one of the nicest, most genuine people I’ve come to know…(and that doesn’t even matter, you could be a total beotch and still have the right to enter again)…how someone could presume to share opinions on whether YOU should enter again or not is beyond me. Like Shelli told us last year, they wanted to give this award to celebrate and recognize people who rejoice in the “art” of stamping, so the artists would have prizes and recognition like the “business-minded” demos. Do people think when Cristina Crawford earns “Demonstrator of the Year” that she should step aside and not try again the next year because she already won before?! Mind-boggling! I just got my on stage and the first thing I did was look through to see what you had won! I knew you’d be in there somewhere and I love it!! I really wanted to enter this year too and give it a try but didn’t pull it off in time…I am in NYC so I definitely can’t, but maybe next year! MJ, keep on doing what you love!! I can’t believe people would say such mean things like “Let someone else have a turn”. How rude! You are amazingly talented and deserve to win, whether it’s your first time entering or fiftieth! Good luck to you! And your blog ROCKS! TFS! Congrats to you on all your work for your Artisan’s projects. I’m sure you will recognized, well deservedly so for all your craftsmanship. Very sad to hear that you would get any negative comments or criticism. There should be no room for negativity whether we you are doing this as a hobby/craft or even a business. Thanks for sharing your projects, ideas & yourself with us through your blog. I enjoy it! You go girl! Let yourself shine!!! Show your stuff! just another stamping supporter chiming in to say ‘ you go girl’!!! you are probably the MOST talented stamper I know, and if anyone deserves to win 2 or 5 or 20 times in a row, it is you. You have the most generous spirit and want to truly share your gift with others, not out of selfish reasons or motivations, but because you can’t imagine NOT giving a part of yourself. that is just who you are!!! and that is why you are so loved by so many here on your blog! so when you’re down & troubled, and you need a helping hand, well come on now sing along with me……………………. You’ve got a friend!!!!! Hi MJ – I hope you win the Award!!!! You are so super talented and I can’t wait to see what you came up with…hope you blow them all away – LOL!!! 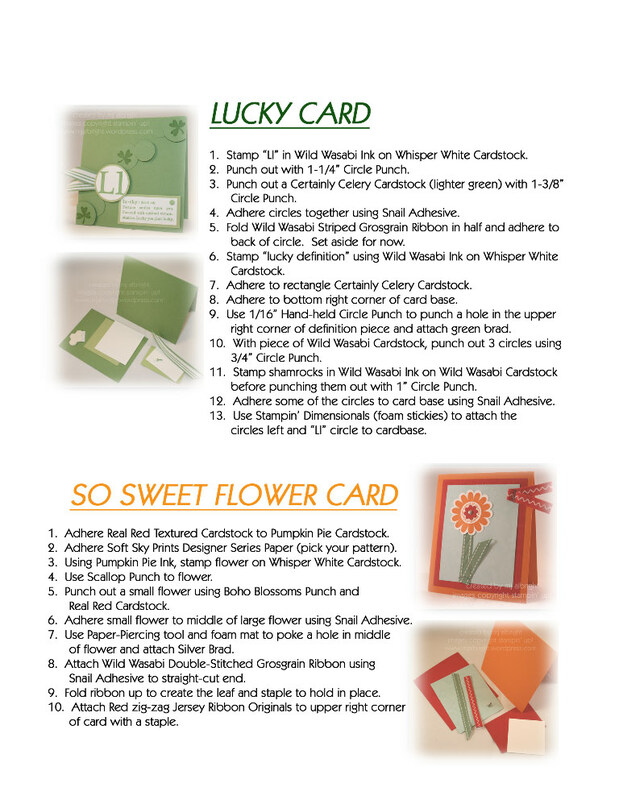 Great cards you all did on the WS – nice hostess set too!!! So sorry to hear about the negative comments! Please keep entering and sharing all your beautiful work. MJ, you dont know me but I certainly am a fan of your artwork. I did see your work last year that you submitted and as always it was gorgeous!!! Good Luck this year!!! I am sure SU will be smart enough to see the cream of the crop!!! Have a great day!!! OK…so here’s my thought on the “you entering again” thing. Why is it anyone’s business? Secondly…those folks should strive to do better and challenge themselves…knowing that you’ve won in the past and the great work you do…they should want to create things that would be as good as what you do so they have as much of a chance at winning the award. If no one is challenged to do better…to beat you…then we wouldn’t see the great work we do from people like you. Enough said…keep up the great work! Thank you for continuing to share you beautiful work. You constantly inspire me to create and if I’m not creating, I’m smiling at the awesome stuff you post. TFS! I just loved the tin for the hostess gift, that is just darling! MJ- I check out your site on a regular basis to get inspiration from your wonderful projects. Please don’t ever stop submitting to SU. 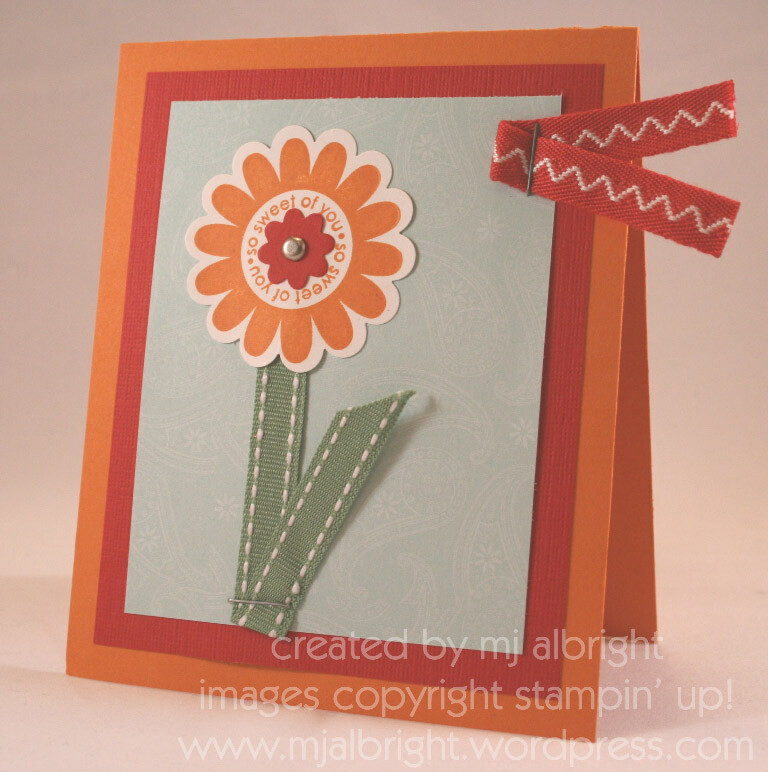 I’ve used many of your ideas in my stamp camps, and the ladies adore these projects. They are definitely a “cut above”. Thanks for sharing, and good luck in the contest!! Your work is beautiful and should be prominently displayed. Would you mind explaining what the 2008 Artisian Award is though? I’m very faithful to SU, but I’m not demonstrator so I’m not familiar with this award. Will your work appear in the next catalog? Where does your work end up? Is there a big prize for you? I’d love to hear more details. I do love that you share your work….your projects are very beautiful, artistic and I’m so glad you are willing to share w/us. I have recently sent in a pkg for a contest at CTMH, so I know how you feel with wanting to get it “just right.” Good luck you you, thanks again for blogging and keep ’em comin! You have as much right to enter as anyone else….one would wonder if those concerned were worried that you were a better artist then them….its nothing more then good old fashioned Bullying…..so good for you for entering again and I hope that you are as successful as you wish to be! Your is wonderful and your willingness to share is inspiring. You are truly an amazing artist, and I love seeing your work on your blog, and in SU publications. Keep on going, keep on doing, keep on winning! If I were to join in on your passion of entering, I would rather go up against someone like you who loves it, and is one of the best, than someone who finds the negativity in everything. Can’t wait to see the reveal! Glad you can breathe again and even blog! And as for the entering again issue. It’s not even an issue, so I would ignore anyone who has a problem with it. You are an amazing person and artist and the award is for EVERYONE! You have the same right anyone else does. Amazing that people would even comment on it. Hang in there and keep doing what your doing. You always inspire me and I can’t wait to see what you came up with!! Sorry others are threatened by your wonderful, creative mind. Please, DO NOT STOP submitting your work. You deserve ALL the awards you win. I for one, would feel cheated if you stopped, because I consider it an honor when I win, knowing I’m up against such a wonderful artist(s). Thank you for sharing your creativity. You are always an inspiration! I checked in on your website and read your article on some peoples negativity for you trying for the artistian award and I just wanted to say that your talent needs to be recognized. There will always be people that will try to knock you down!!! Have a great night and I hope you win!!! WoWZA!!! WoWZA!!!! WoWZA!!! So proud of you for entering..I know that we will be blown away when we get a chance to see your stuff! Congratulations on the entry achievement! That is a total, complete accomplishment! First let me start by saying, I am a HUGE fan of yours. Your work just blows me away. I figured you had to be up to something since we hadn’t seen “regular” posts from you in awhile. glad to hear you entered again, I would be shocked if you didn’t win again. Can’t wait to hear the good news! I’m not an SU demonstrator so what exactly is the Artisan of the Year award? I wish you the BEST OF LUCK on the Artisan Award!!! You put a lot of love into it and that is what counts. I think I’d get emotional too seeing my daughter up on some display board or in print! 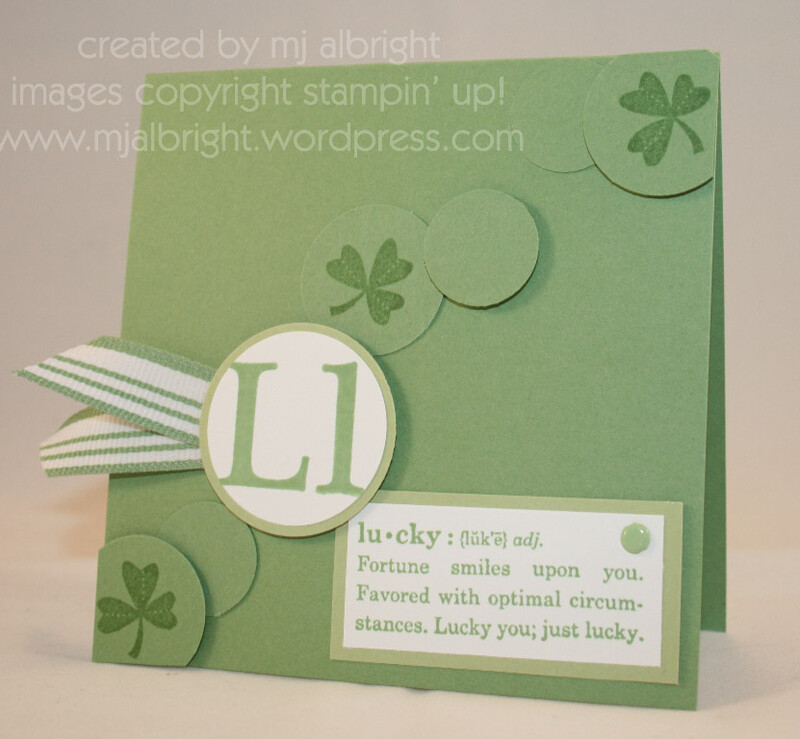 Your card projects are fabulous!! I love how you do your sheets! Fabulous idea! I have one of those tins in my stash but I can never get it covered nicely. I’m not good at cutting paper to fit a cylinder or slope. Any tips? Thanks for sharing all your awesome work!! MJ, you do such beautiful work and pour everything you have into it . . . all of your heart is right there in cardstock and ink. You have my best wishes and support! MJ, I am excited you entered again. You are such a gifted stamper and you share so many great ideas with all of us! You are truly amazing and deserve to win. I can’t wait to see your name as one of the winners and see all the wonderful things you created! You rock girlfriend. P. S.: It’s Friday morning! Did you have time for the sketch??? I am floored that you would receive negative comments about entering the Artisan Award contest again!! You are one talented lady and deserve all recognition that comes your way! I know it might be hard to just let those comments go, but just know that there are many stampers out there that are routing you on….You go girl!! These cards are darling, btw!! I really enjoy your blog and your beautiful creations. You are obviously extremely talented and I say – GO FOR IT! Let others go for it too, anyone who wants to. If you win it 12 times in a row, then good for you! Let me chime in with the rest! Please do keep submitting your work. As Charmaine said in post 21, the naysayers should be inspired and challenged to do better if they want to win the award. TFS your talent and work with us. I have to say, I am shocked and appauled that anyone had anything nasty to say to you. I just am always in awe of your talent, and I love coming here to be inspired by the beautiful things you create. Not only am I glad that you entered the Artisan Award contest, but I very truly hope that you win. Your talent is so deserving of recognition! MJ, I can’t believe anyone would criticize you for your Artisian Award entry! Anyone who is willing to go through what you went through to submit your best work, deserves Stampin’ Up!’s fair consideration! You sure have my interest perked … can’t WAIT to see your entry project …l’m sure it’ll knock my socks off! Love your class projects, and especially like the altered tin! TFS!!!! GOOD LUCK on your Artisan Award entry. I cannot even IMAGINE the work and creativity you put into it!! Your blog inspires and amazes me everyday!!!! I can’t even CASE your stuff let alone come up with something as beautiful as your stuff from scratch!! LOL! I LOVE the hostess “bucket.” That is awesome!!! Congratulations to you for being as beautiful a person on the inside as all of your creations…giving of your talents so freely to others’ enjoyment!